The afternoon entails some effort, contorting between small galleries and the small piles of remaining valuable matter strewn there. Eyes and knowing hands reach into these spaces to inspect the stuff arrayed there. An instinctive evaluation is made, and then the search moves on. Or otherwise something catches the eye and more active thought amplifies this assay. A crouch or stoop is made towards something. Thoughts start connecting, an object is foregrounded and given attention. It provokes a desire to make it fit – with previous encounters with similar things, with families of things and with ideas that attach to such things. The thing here, is a small lidless cardboard box containing a handful of small yellowing pieces of paper, portrait photographs and a couple of old Christmas cards. The box is positioned prominently, atop a low coffee table, accompanied by other items offered up here for sale, in this antiques market staged in an old warehouse. Many of these items look like they have come straight from the house clearance van. It is hard to see who would want to buy much of this stuff, it is not garish enough to be retro or ironically kitsch. It is just stuff that people lived their everyday lives with during the last century, and for reasons best known to them – whether fondness, poverty or inertia – carried with them through to the last days of their lives, and the visit a few days later of that battered white van that comes to take our stuff away, after the black hearse has already taken our bodies. The banality of this battered box and its random seeming paper stuffing intrigued me – but only in a very low key way. I delved tentatively, looking first at the greetings cards and the photos. They were connected. The cards contained photos of a young boy, giving a time sequence, 10, 13, 15? : it was hard to tell. The clothes remained constant – an inter-war short back and sides and dishevelled shirt and jumper – only the facial features hinted at a passage of time, as the boy’s face elongated and became more taut across the years. Next I opened up one of the folded slips of paper: a school report. Some good marks, one endorsed ‘top marks in the class’, but with the summation beneath urging this pupil to work faster. By this stage I had realised I was drilling into someone’s life, as presented by this collection of life-defining paper-based moments. But I was still feeling only mildly intrigued, this was still an idle rummage. I carried on. I wasn’t sure what I was looking for – or, indeed whether I was actually in pursuit of anything (although inevitably a base urge to resolve this stuff to a narrative or other framing was in play). The next papers I unfurled revealed this boy to have become a miner at a colliery in West Yorkshire, working there in the 1960s and 1970s. 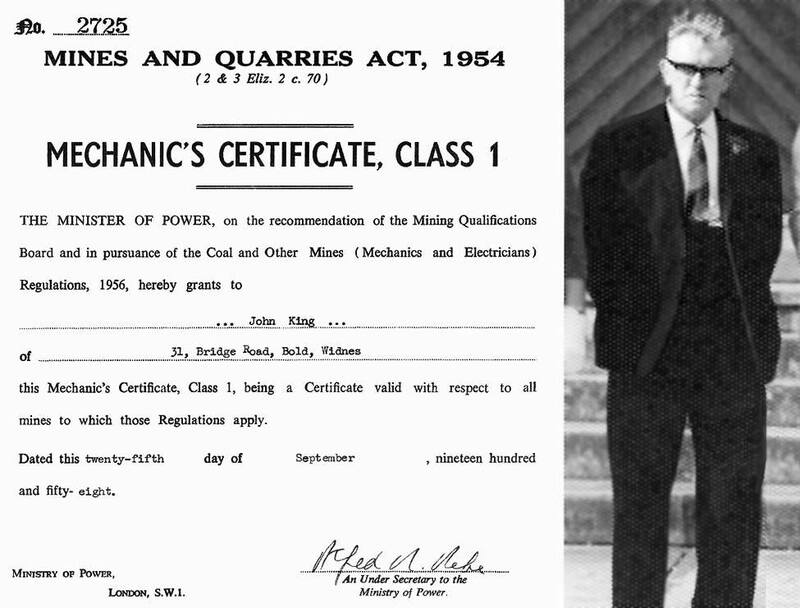 The paperwork was a variety of certificates and working permits issued by the National Coal Board to this man, charting his progression through a variety of qualified roles within the mine. These slips of paper were pre-printed, with gaps filled in by the authoritative fountain pen strokes of a manager, the application of that ink to that paper having magical effects – our box-man became a certified shot firer upon the completion of that form on 23 January 1976, he had also become a special person when handed his morphia licence sometime thereafter, along with its attendant pocket-sized laminated instruction sheet and their vital instruction for navigating that fine line (underground, in the dark and after something terrible had happened there) of life-saving and life-taking. It seemed, then – that I was peering into someone’s ‘important things’ box. I grew up with the convention that you have a place somewhere in your home where you keep all of your important items, and those items are your ‘papers’. Perhaps you have such a box too, hidden somewhere – secreted in the modern day equivalent of a Priest’s glory hole or a Saxon cache somewhere in the fabric of your house. Or maybe it sits in plain view, a long emptied cereal packet, now the repository of your very identity and being. Our entry into a digital age has perhaps reduced the centrality of such still-in-use time capsules, but we still need our ‘papers’ to remind us who we are, were we’ve come from and to tell others who we are too. Much may remain of the memory of this miner elsewhere – indeed, I don’t even know that he is dead. But the occurrence of his important things box in an antiques market suggests that has possessions no longer have their owner to cherish and protect them. Staring into the box at what this person had selected for safekeeping there, and at the oft-folded creases of these treasured documents, emphasised for me this link between building a life, becoming through – and with – ‘important’ stuff and in particular the role of ‘papers’ as a way of regulating both memory and capacity. This is particularly true of the highly regulated underground spaces of a coal mine. The Mines & Quarries Act 1954 very-much embodies a mid-20th century world of military-like ranks and chains of command, (very) specific demarcation of roles and competencies. It created (or represented – the distinction is actually a difficult one to draw) a world of tasking and verification that was based upon the carrying and presenting of slips of paper. The other documents in the box where also mining related – memos and works specifications for the refitting of obscure sounding machinery, their lists of serial numbers and their precise plotting of works-to-be-done upon them. Why were these kept? Perhaps our miner saw these projects as the defining heights of his working life; or perhaps these were the jobs where it all went wrong, and he lived in fear that some blame would eventually beat its path to his door and he would then need this paperwork to fend it off. Or perhaps these where his favourite machines, the ones he felt attached to, perhaps they comprised his ‘home territory’ underground. This stuffed box did not say. Perhaps the reasons were all these and more, or none. All that is certain is that these papers were in that box. In this box we seem to find what mattered to this miner – we also see that his job was essentially about knowing how to interface, how to fit into the mine as a system, which parts of it he could visit, which materials he could have a relationship with and in what circumstances and for what purposes. This paper will explore the ways in which meaning is brought to a quarried void in southern England. Prior to its closure in the 1920s the site had been a source of fine building stone for over 2,000 years, that rock quarried in turn by Romans, Anglo Saxons, Normans and subsequent generations. The site is now a small scale tourist attraction, with enthusiastic local guides taking visitors below ground and into the emptiness of the evacuated strata. According to a guide’s deft narration of the pasts of this site this place is rich with history and yet it is also a place at which there is nothing to see. This is a tour of a void, the only meaning here is that cast into this emptiness by the interpreters of this place. This presentation will examine the narrative and performative practices by which a sense of the labour and lives once lived here are summoned, and also how a sense of the materiality of this place is necessarily also framed and presented. In doing so the analysis will consider – after Raphael Samuel (1977), Laurajane Smith (2006) and Tim Strangleman (2013) – the motivations of post-industrial homage at sites of former (hard) labour, and the sense in which historical-materialist and neo-materialist (and post human) accounts of the physicality of our world and our relationship to it collide in such places. The presentation will outline the processual understandings of mineral working, its flows and absences found in the recent work of Bruno Latour (2005), Tim Edensor (2013) and Tim Ingold (2010) in social theory, cultural geography and anthropology respectively, and in the accounts of human-matter entanglement advanced by Ian Hodder (2012) and Bjornar Olsen (2013) in archaeology.